People did not want to burn their dead with the round kandas/uapalas. But now cow dung are being made into long logs by this machine that makes them with minimum manual intervention. Lakhs of people die in India every day. The Muslims bury their dead. The Hindus burn theirs. Conventionally, firewood, electricity or LG gas is used to burn human bodies all over the world. But there is no more ‘waste” wood left to burn. In Delhi they have found a unique solution. The government gardeners pretend they are going to “trim” the existing trees. They lop off most of the large branches (often killing the tree) and sell them to Nigambodh ghat. The profit is given to the whole department – much like the traffic police share their bribes with the entire thana. In rural India, a death in the village means a tree is cut down, and the most common victims are mango trees. So, wild mangoes are disappearing, and with them goes the entire pickle industry. It takes about 600 kilos of wood to burn one body. The cost to the survivor is above Rs 15,000 or more. The act itself of cutting a tree is illegal, but who cares when a parent needs to be cremated. A separate problem is the cow that has stopped giving milk. The farmer does not want to sell her to the butchers, but he does. Or leaves her on the road to fend for herself. She wanders into the fields and is beaten to death with lathis. Or her legs are cut viciously by the barbed wire that most farmers use illegally. Hundreds of terribly wounded cows come to my hospital in Bareilly every day, their skin stripped off their thighs and their bones exposed. Gaushalas are few and far between. And most of them are prison cells for this gentle animal, which often starves to death in the gaushala itself. There is no proper management of any gaushala, no doctors, and often the owners show the same disdain towards the milk-less cow that her previous owners did. Here is a business solution to both problems. We need to change our attitude towards the cow. Milk is not the most important part of the cow, it is her dung. This cow dung should be used in the cremation grounds. For Hindus, the cow is sacred and so using cow dung, instead of wood, should not pose a problem. There is a machine for making cow dung logs. My gaushala in Delhi has bought one two years ago and we sell the logs to Nigambodh Ghat. Even though we are not regular, because we are far too busy with actually saving cows, we earn Rs 60,000 a month. It is a fraction of what Nigambodh needs: they could absorb a hundred times that amount. 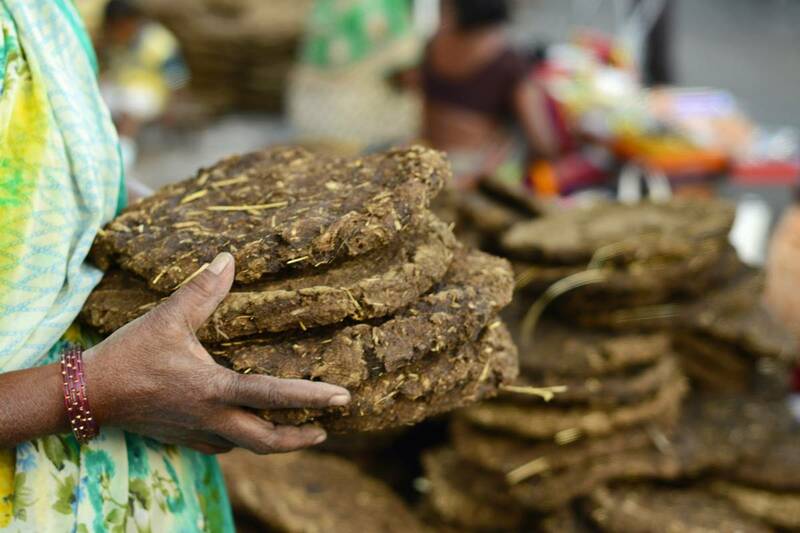 Cow dung logs cost less. There was an optical problem till recently, since people did not want to burn their relatives with round Kandas/Uapalas. But now they are being made into long logs by this machine that makes them with minimum manual intervention. While putting fresh cow dung into the machine, we also put a little fragrant “havan samagri”. The cow dung log making machine is very reasonably priced, between Rs 25,000 – Rs 35,000. A combination of dung and straw (or any agro waste – harvested crop residues) is fed into the hopper of the machine. A screw mechanism is provided in the machine which helps in mixing the raw materials thoroughly, compressing them and extruding them out. There are different moulds to make different log sizes. The logs are then put in the sunlight to dry out the moisture, making them hard and sturdy. The machine can be operated on electricity, one horse power motor, or even manually. It is easy to operate, requires little maintenance and no hard labour. Even women can operate it efficiently. A cylindrical hole in the centre is provided to facilitate easy drying and efficient combustion. The machines available are capable of making one log per minute of 3 in. by 3 in. and 3 feet long. Logs can also be cut into small pieces for use in choolas and havans. The slurry from biogas units can also be used for making logs, by mixing it with straw of any harvest residues. Almost every village in India has a cremation ground. Every town certainly has two. If someone were to take a contract to supply the logs to them, they could earn lakhs for the gaushala and for themselves. Cows would stop dying of starvation and be treated with more respect. Cow dung can also solve another very important problem. The trees of India are supposed to be planted by the forest department. They get crores of rupees every year to grow trees and then to plant them. Their success rate according to their own figures – is 2 per cent! One of the reasons (apart from the fact that they never grow plants in their nurseries, and pinch the money!) is because they grow the seedlings in thick black plastic bags which they buy for Rs 4 each. This is expensive, but, even worse these plants are usually planted along with the plastic by careless forest labour, resulting in 100 per cent mortality. Maharashtra and Uttar Pradesh supposedly planted 1 crore trees each last year. Less than a few hundred have survived. Think of the waste of your tax money. Another machine by the same maker exists, to make cow dung flowerpots of different sizes. These can be offered commercially and sold to the forest department for their nurseries, and to private nurseries. The pots give nutrition to the plants, withstand the rain and watering and can be planted in the soil along with their plants. We would, have a dramatic increase in trees and reverse climate change. Every state government should change their policy, so, if you are reading this, please cut it out and send it to the CMs and Forest secretaries. (To tell you the truth, I tried with one state. The CM agreed. I sent the machine. The local forest officers said it didn’t work. It turned out that the plastic sellers pay them a rupee per bag). The logs and pot making machines can be purchased from: Dip Technologies, 10-11 Umiya Estate, Near Bharat Party Plot, Rabari Colony, Amrai Wadi, Ahmedabad, Gujarat 380026 Ph: 8048018796.